Did you receive an email from the Google Publisher Policy (noreply email) regarding a violation that occurred in the last 24 hours on one of your AdSense serving websites? The e-mail does not contain details about the page or website the violation(s) occurred. This is a Google courtesy email, since you should always be in compliance with AdSense policies. Login to your Google AdSense Policy Center to review the violation details per the steps below. On the left side, click Settings. Select Policy Center. You will see a list of active violations and the domains they are occurring on. Click a violation for details by selecting the down arrow next to it. You will see the page URL (although the URL may appear abbreviated, you can copy/paste the entire URL the same way) the violation is occurring on and the violation details. Take immediate action to resolve your AdSense violation. When you have fixed the AdSense page or URL violation, select request review. Google suggests reviews may take up to 1 week. Good luck! Remember to obey Google AdSense policy terms at all times! Sometimes we accidently publish pages or articles with little content or allow profanity where it should not be. Always take great care and carefully review content on your website. Google AdSense remains the best affiliate marketing platforms on the Internet. This Google Publisher Policy Report gives you an overview of recent activity related to violations found on specific pages of your websites. As enforcement statuses may change over time, please refer to the "Page-level enforcements" section of the AdSense Policy Center for the current list of active violations. Please note this report doesn’t cover violations that may happen on an overall site or account level. You may be notified by a separate email if site or account level violations are found. Ads will continue to serve where no policy violations have been found, either at the page- or site-level. New violations were detected. 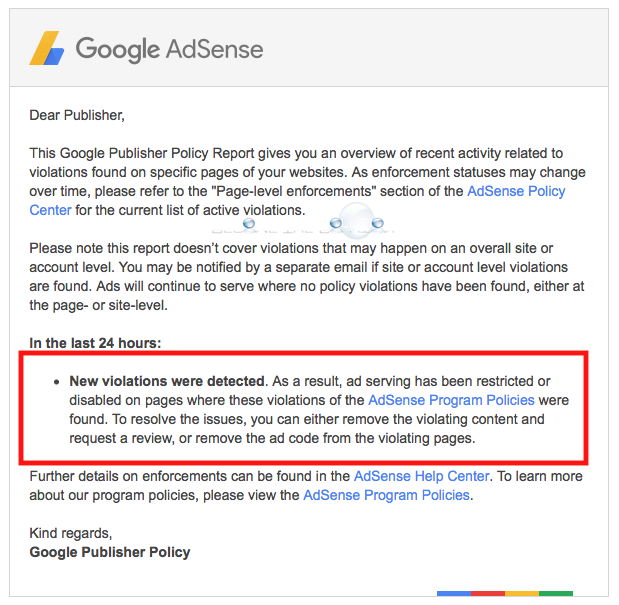 As a result, ad serving has been restricted or disabled on pages where these violations of the AdSense Program Policies were found. To resolve the issues, you can either remove the violating content and request a review, or remove the ad code from the violating pages. Further details on enforcements can be found in the AdSense Help Center. To learn more about our program policies, please view the AdSense Program Policies. How To: Install Google Duo for Mac OS X and Face Time (like) with Android Users! Why: Amazon missing package - must return original item for refund, but no item to ship? Google Search Console: Something went wrong. ADP – Unauthorized User Your access is currently unavailable.